Here’s to 2013 from all of us here at M8, your local mate in the UK! Phew! What a hectic few weeks it’s been – filled with Christmas parties, family reunions, celebrations with friends and LOTS of navigating and travelling across the UK! To finish off the festive season 2012 with a bang we’re looking toward New Year’s Eve and the prospect of a little more reveling! It’s the perfect chance to bid farewell to this most fabulous holiday and welcome in 2013 spectacularly with friends and family. New Year’s Eve means many things to many people and the options – staying in, heading out, going on holiday – are endless. Here’s our advice as we prepare for what can be, the biggest night of the year! Make the most of M8, your local mate in the UK! We couldn’t fail to suggest using M8 on New Year’s Eve! It’s the perfect companion for you within your iPhone, Android smartphone or BlackBerry Touch device. 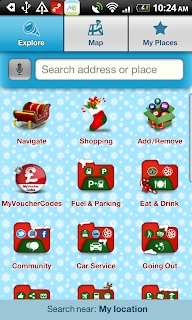 It’ll help you with all of the essentials needed for a stress free New Year’s Eve – making sure you beat the traffic with up to date traffic news, bag the perfect parking space, find a handy cash machine, check who’s nearby on social networks, and keep any drivers out there on the road with petrol station location notifications. Perfect! Rather than trying to connect with people using your mobile via FaceTime or Skype in the middle of a noisy crowd this evening, arrange to talk to friends who are far away on New Year’s Day to welcome in the New Year. You could even arrange a bit of a reunion on Google+ hangout complete with everyone’s favourite drinks and music to keep the party atmosphere running well into 2013! We’re lucky that the UK has fantastic wifi so use it on New Year’s Eve to post photos and keep up to date with everything that’s going on. With many forms of public transport now offering wifi connections, it’s easier than ever to keep in touch and share the good times! Most of the UK’s public transport operate a revised service this evening and tomorrow, so make sure you plan your travel out to the party AND your journey home – no one wants to be stuck at a bus stop with no service running and faced with either an eye-watering taxi bill or a long walk home. Those of you partying in the Big Smoke are lucky enough to have free travel provided by the sponsors Diageo – woohoo! It’s exciting to think that every single one of us is expected to get a kiss at midnight on New Year’s Eve (even Colin from IT support!) So as not to disappoint that lucky special person, make sure your lips are suitably kissable. Cold weather plays havoc with your lips so get your lips ready by giving them a little TLC. Exfoliate, regularly apply lip balm – not too shiny, folks – and pucker up! Huffington Post has given some fantastic tips for achieving a perfect midnight smooch that will kickstart your 2013! The first and most important rule should you decide to travel by car on new Year’s Eve is to agree on a designated driver. We all know that when the bubbles flow it’s easy to get over excited and forget that you’d offered to be the chauffeur for friends and family, but it’s really not worth it. Make the decision fairly and ensure that the designated driver is catered for with a range of non alcoholic drinks that are a little more festive than a boring glass of tap water. Those smart ladies at netmums have come up with some fabulous ‘mocktails’ – give them a go! Be aware of traffic restrictions in place in towns and cities across the UK this evening and tomorrow to make way for street parties or fabulous public fireworks displays. Plan your route using accurate sat nav or maps, and think about where you’re going to be able to park – M8 is certainly a handy mobile app to have with you! Oh, and finally….Christmas jumpers were a big hit this year and we think New Year’s Eve is another perfect chance to have fun with novelty outfits and props. Dig out comedy glasses, party hats, glitter balls, tiaras, confetti and such like this evening to keep that festive feeling going until tomorrow! Remember to send us your photos on Twitter at @localm8 or on Facebook! So, in addition to handing out our top tips, and advocating the usual advice of staying safe and among friends, partying peacefully and drinking responsibly, here at M8 HQ, we hope that you have a stress free New Year’s Eve filled with lots of fun and laughter! Just in case you need a quick reminder, you can download M8, your local mate in the UK from Google Play, iTunes and from BlackBerry Appworld. Have a great night, and here’s to a fantastic 2013 for all! We’ve reached the final countdown before Christmas and for most of us, that means lots of shopping, partying and….travel. With temperatures dropping, traffic threatening gridlock and stations increasingly looking like packed cans of sardines, getting from A to B – whether driving or traveling as a passenger by bus or train – can quickly turn into a stressful experience for you and all those around you. Here are our top tips for making sure travelling at Christmas doesn’t dampen the UK’s festive cheer! Those of you travelling by plane, train or public automobile (bus): Give friends and family your ticket and journey details. This makes it easier for them to seek information if there are any delays, and you never know, they may take the opportunity to surprise you by coming to the station to collect and bring you home – hurrah! Let’s face it, a welcome party is certain to get you in the Christmas spirit and start your holidays with a great feeling! Drivers: Plan your route and get organised in terms of navigation. An accurate sat nav system seems a more sensible idea nowadays rather than relying on companions who’ll no doubt crumble under the pressure, or having to pull in to the hard shoulder every ten minutes to wrestle with a crumpled up map. Not leaving enough time when travelling by car causes stress, speeding and arguments – a dangerous combination. For other Christmas travellers, leaving yourself short of time is just as threatening. Having to rush through crowds carrying too much luggage whilst wearing too many clothes may cause you to faint or do yourself another injury. Also, it’s not a good look for anyone, and escalates into a thoroughly stressful experience that will swiftly quash any feeling of festive cheer you might have had. So to reiterate, avoid a last minute desperate panic a la the McCallisters in Home Alone, make sure you have ample time to travel. On the roads, on the pavements, on station platforms – be aware of your speed and the speed of those travelling around you. Don’t act like Lewis Hamilton on the roads, and don’t dawdle in the pavement – both are irritating and create unnecessary stress. Not only does adverse weather make driving conditions dangerous, it can cause horrendous travel delays. Pop an emergency kit covering passengers and cars in the boot of the car. For passengers include water, blankets, food and games for kids, and safeguard your car by keeping a shovel, spare tyres, a torch, first aid kit and battery jump leads in good condition and ready for action during Christmas and throughout the winter months. With cars being more likely to breakdown in adverse weather – of course they are(!) – the fonts of knowledge over on Foxy Lady Drivers have some useful advice in the event your car packs up while en route. Make sure you have enough food and drinks with you. Not only for those travelling by car in preparation of any long traffic queues, getting stuck in bad weather or breaking down, making sure you pack a decent picnic is crucial for all long journeys. Perfect for fending off boredom and hunger, tasty nibbles put you in the holiday mood! Be warned, however, that selection is key. No one wants to get food envy while sitting opposite someone who’s feasting on a well-thought-out hamper, so choose a good balance of savoury and sweet so you don’t get sick of any one thing! Travelling home is a great chance to listen to music, read, sleep, watch movies, eat, and generally relax following what has been an undoubtedly hectic week of preparations and socialising. A word of advice from us here at M8: Consider your fellow travellers. They may not enjoy the sound of your slurping from a bottle of juice, or indeed being subjected to your latest soundcloud remix, muffled only slightly by your ear phones. Nor are they certain to see the funny side if you spend the entire trip from Edinburgh to Birmingham laughing hysterically at the latest Kevin Bridges show. Be mindful of others, and adjust your behaviour accordingly should you snort when laugh, or plan to take a picnic with a smell that may make people gag. Consider everything and ask yourself – will it prove offensive to the majority of passengers? All hosts at Christmas are in a slightly heightened state of panic trying to get everyone and everything organised. The last thing they need is to start worrying about people getting lost, missing planes or breaking down, so keep your iPhone, Android smartphone or BlackBerry device charged and keep them updated if anything sets you back. Also, keep your mobile phone on you so they can contact you if needed. This can be a stressful time and some people travelling over Christmas and New Year just want to relax…in their own company, and in silence. Others may want to begin the festivities early and are looking to strike up a new friendship. Don’t be offended if the person next to you doesn’t show any interest in the saga you went through to find your Granny the perfect set of bridge cards, nor react aggressively if they want to regale you with their Christmas family traditions. Respect that people are different and like to travel in their own little special way – everyone will then enjoy Christmas travelling a whole lot more. Safe travelling folks, and remember to contact us on twitter @localm8 or over on our Facebook page! We gave you festive season party tips 1 – 5 this morning, so here you go folks – the final five tips from our team here at M8 HQ to help you survive and have fun this Christmas! We’re not advocating binge drinking, we’re talking about healthy hydration. It may seem like common sense, but it’s pretty difficult. During the day, all we crave is coffee and sugar to keep us going and don’t start us on trying in the evenings…. Minimising hangovers, helping keep tiredness at bay, making your skin glow and supporting your tummy as it copes with rich foods and drinks, water is the elixir of life so do try to hit the recommended 6 – 8 glasses a day. One of the M8 app team – and he always looks fresh as a daisy – suggests drinking a large glass of water first thing in the morning, and another just before bed to help you toward peak hydration! Simple. Check out local cafes, restaurants and bars for money-saving deals offering discounts, 2 for 1 vouchers, that sort of thing. Spas and beauty salons also tend to offer special packages to get you ready for Christmas, or to wind down in January, so keep an eye out and snap them up! On a serious note, just because it’s Christmas and you’re full of joy and goodwill to all, don’t assume everyone else will be. Ladies keep your handbag zipped and with you at all times, and don’t leave your drinks down. Guys, it might be an idea to move your wallet from the back to your front pocket, and if you’re driving through busy city centres, always lock car doors as a precaution. Think about keeping some extra cash on you. From splitting bills and leaving tips, to that all-important kebab, bus fare or last minute taxis, it’s handy to have extra money and change in your purse or wallet. Stuck for money and can’t find a cash machine? Check the M8 app on your iPhone, Android smartphone or BlackBerry Touch device and it’ll show you all the cash machines located nearby. We all love Christmas parties, but they should come with a warning. One of our top survival tips has to be…no matter how attractive someone might appear, don’t go there! It’s almost always going to be a bad idea to pursue Dave the Janitor or Janet from Accounts on the night. Check out this article on Female First revealing that 1 in 7 Brits are set to make a move at the office party – scary! Our advice? Wait until January. If the sparks are still flying then hey, we’re not ones to stand in the way of love! What would be your top tips for Christmas partying? Tweet us @localm8, or catch us over on Facebook! You all seemed to love our Christmas shopping tips – and have been bagging some fantastic MyVoucherCodes deals using M8 along the way – so we’ve come up with another Top 10 for… partying! With so many social outings organised, we find ourselves caught up in a haze of office parties, liquid lunches with friends old and new, family brunches and carol singing! Exhausting….but we wouldn’t have it any other way! Make like the Boy Scouts and prepare yourself! With colds and winter bugs – not to mention hangovers and other ailments associated with overindulgence – threatening to kill your buzz at Christmas, stock up on vitamins and medication to keep you in tip top condition. Essentials for our team include effervescent vitamin tablets, paracetamol, rehydration sachets, tummy settling medication and milk thistle – a winning bathroom cabinet line up! 2. Call on your local M8! Yes we may be biased, but M8 is the perfect mobile app for your iPhone, Android smartphone or BlackBerry Touch device as you party this Christmas! A handy companion, it’ll help you bag a spray tan and manicure offer through MyVoucherCodes, select the best place to sample mulled wine or taste good pub grub and provide great directions, locate a cash machine when you need one, get the best 2-for-1 pizza when bars close, and get any designated drivers home again without running out of petrol. Multifunctional I think you’ll agree! Christmas revelling sorted, from start to finish – perfect! We tend to burn the candle at both ends in the run up to and over Christmas, so some occasional primping and polishing is necessary. We find the 28th particularly terrifying and a day that usually sets a little ‘emergency work’ in motion. At-home treatments such as uplifting aromatherapy bath oils, revitalising face masks, (streak-free) fake tan and illuminating makeup are like liquid gold to members of our #M8 team and we thoroughly recommend a little pampering session mid party season – great for mind and body! Take advantage of great packages and discounts that beauty brands offer at Christmas – treat yourself and keep sparkling ‘til New Year’s Day! With so many people to meet, Christmas is the perfect time to try something new in your local area, or wherever you find yourself in the UK. Make plans to go for breakfast, brunch, lunch, afternoon tea, cocktails or dinner – there are so many opportunities for festive fun! Essential. It’s going to be freezing when you travel to and from a night out, guaranteed. So, for a stress free evening it’s best to plan your route, check for reduced services on public transport, book a licensed minicab before you set out, or even give your liver a break, and drive! If you do leave travel planning until home time, make sure to wait at a designated taxi rank, and never alone. NB. Remember, if you’re going out and plan to have a few drinks, avoid early morning chauffeuring people to shops, meetings, or anywhere else. It takes longer than you think to get rid of alcohol from the system so put the car keys down, relax, have a good breakfast and watch a Christmas movie instead. Stay tuned for more Festive M8 top tips this afternoon! It’s that time of the year again, folks! We’ve come up with 10 tips to make sure your Christmas shopping experience is fun…or relatively stress free at least! Nothing to do with planning really. Sure, it does help to know what you need to do, who you need to shop for and where you need to go, but the most important benefit of a list? Ticking things off it. Make sure you’re giving yourself that simple pleasure and sense of achievement – make that list, tick everything off and you’ll feel like a winner! Rather than rushing into town at 6pm on December 23 with a panicked look on your face, starting early means you can research online, take time to think about the person, and enjoy leisurely shopping. To reward yourself for such organisation, we recommend regular treats. A drink in your favourite bar, dinner with a friend to review your purchases, that sort of thing – we assure you it works wonders! A handy tip from the parents in our team. Negotiating crowds with a buggy and/or little people is not easy, so ask willing friends or family to babysit so you can go shopping on your own and be much more efficient, then you can repay the favour – genius! If none of your friends have children, we find a suitable bribe works a treat and it’s a small price to pay for stress free shopping. No need to get dragged along on Saturday afternoons if you can help it – save them for brunch, lunch, or afternoon tea with friends and family. If you do find yourself shopping, keep an eye out for events or exhibitions that might act as incentives for unwilling shopping partners or welcome respite at the end of the day – the UK has some fantastic things going on this Christmas. We know it may seem drastic – you may have had the office party the night before, or plan to have a late one that evening – but when it comes to Christmas shopping, getting a head start is a great idea. Get to the shops as soon as doors open to ensure you nab a handy parking space and beat any queues. We’ve all been there – you get up at the crack of dawn to beat the Christmas traffic and crowds. Having negotiated the High Street or shopping centre all morning you’ve managed to tick a number of people off the list but there’s still a couple of tricky gifts to find, and then it hits: It’s 3pm, you’re irritated by everyone and everything, and your legs have suddenly gone wobbly at the lack of food, rest and fluids. Stop! Find a nice cafe, bar or restaurant, sit down and recharge those batteries for a while. You know what we mean. Get stocked up on every non perishable you can – the snacks, the booze, the party food, the poinsettia, the baking ingredients – and do it as soon as possible. Supermarkets get extremely busy in the last week before Christmas, and no one wants to battle trolleys, or be left searching shop after shop for the gold chocolate coins that quite simply make or break your family’s stockings! 9. Let M8 your local mate in the UK help you! We couldn’t fail to suggest using M8 during your Christmas shopping! 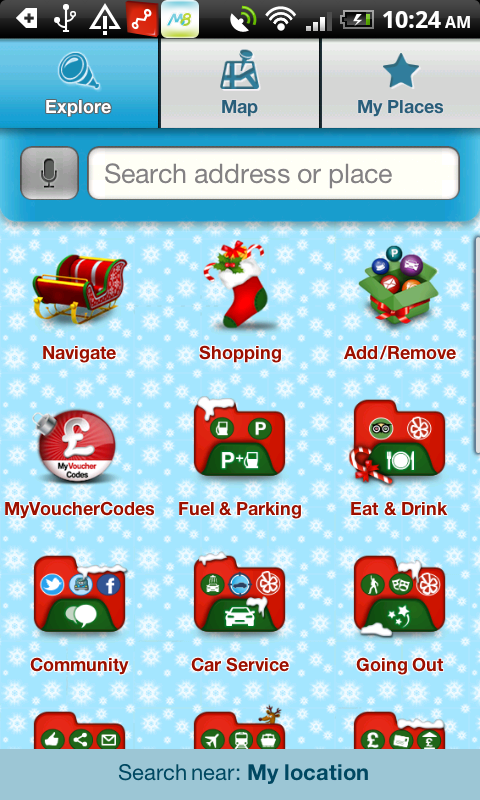 It’s a little helpful Christmas elf living in your iPhone, Android smartphone or BlackBerry Touch device. It’ll help you beat the traffic, find a parking space and cash machine, check who’s nearby, select the perfect lunch spot, bag yourself a couple of bargains, discover a hidden gem along the way, and get you home again without running out of petrol. Perfect! Christmas shopping is supposed to be fun. Our advice is just to relax and remember this: Even if you don’t get gifts that are quite right for everybody, the people you really care about won’t hold it against you at all, well, at least not long into the new year. Do you have any Christmas shopping tips for the M8 team? Tweet us @localm8, or catch us over on Facebook!